Women are rallying together in a massive and unstoppable force to make their voices heard around the world in ways we have never seen before. When Dr Kirstin Ferguson, an Australian company director, decided she was fed up with the vicious online abuse of women she turned the tables and used social media to create the #CelebratingWomen campaign, profiling two women from all walks of life and from anywhere in the world, every day for a year. The response was overwhelming. 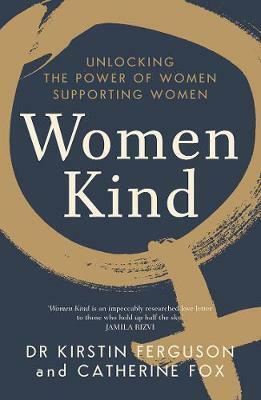 In Women Kind, Ferguson joins Walkley award-winning journalist and leading commentator on women in the workplace Catherine Fox to examine how women’s shared clout is transforming communities, workplaces and leadership; show that every woman is a role model; and challenge the idea that women regularly turn on each other for scarce seats at the top table. Ferguson and Fox urge us to get on board and forget the old saying that when a woman climbs the corporate ladder, she needs to send it back down to help one other woman. What’s needed is a fishing net to bring up many women together, all supporting each other. There has never been a better moment to join our voices, share experiences and celebrate the power of women supporting women.